Please join us in wishing everyone a very special and happy Veterans Day! 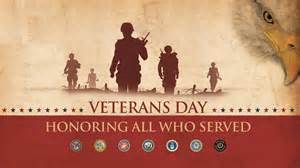 We extend a big THANK YOU to all who served for our country and the families who sacrificed and supported them! You are remembered! What a week in the news - the President's trip, the tax bill, General Flynn, Judge Roy Moore, the Virginia and NJ elections, and of course the widening circle of sexual misconduct allegations that are coming to light, not only in Hollywood, but all over - so much to discuss. Please join us in wishing everyone a very special and happy Veterans Day! We extend a big THANK YOU to all who served for our country and the families who sacrificed and supported them! You are remembered! What a week in the news - the President's trip, the tax bill, General Flynn, Judge Roy Moore, the Virginia and NJ elections, and of course the widening circle of sexual misconduct allegations that are coming to light, not only in Hollywood, but all over - there's a lot to discuss.